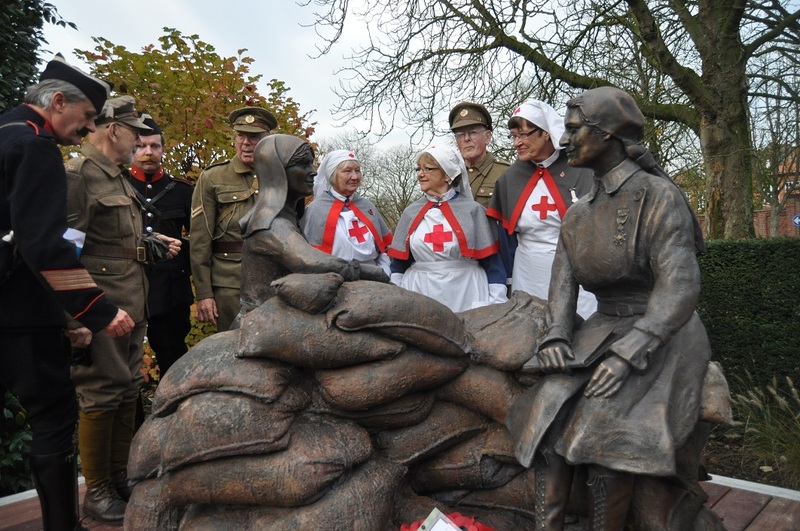 The statue commemorates the courage of these two ladies in setting up a first aid post at Pervyse, Belgium during the First World War. The historian Dr. Diane Atkinson has written a book about the two women 'Elsie and Mairi Go To War - Two Extraordinary Women on the Western Front' which was first published in 2009. 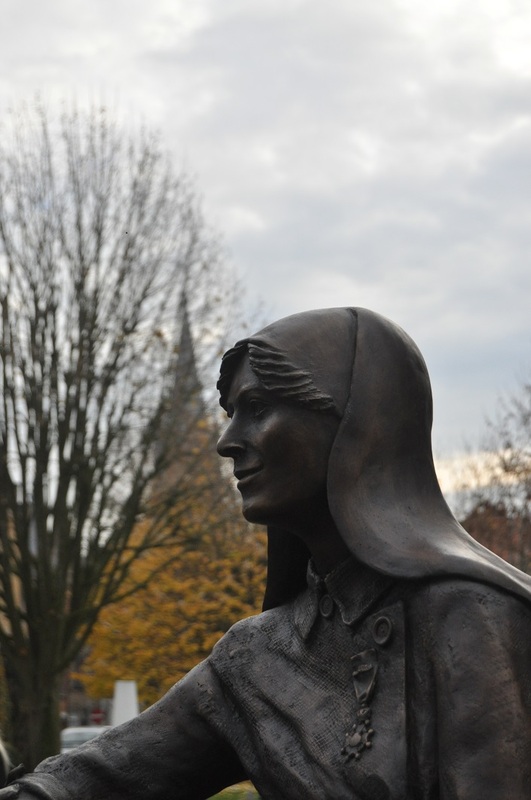 Diane was so impressed with the selfless work of Elsie and Mairi that she determined a statue should be made to remind people of a time when many put themselves in danger to help save others. Originally Diane thought of having the memorial in London where Elsie and Mairi spent time fund-raising to keep their first aid post going. 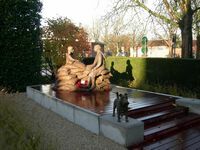 Always with the idea to complete the statue in time to commemorate the centenary of the start of WW1, it was decided that the statue would be best sited in Belgium. A site at Pervyse where the famous 'Cellar-House' had been proposed but eventually the town of Ypres was chosen - Ypres where many memorials stand today including the Menin Gate and Flanders Memorial Museum. 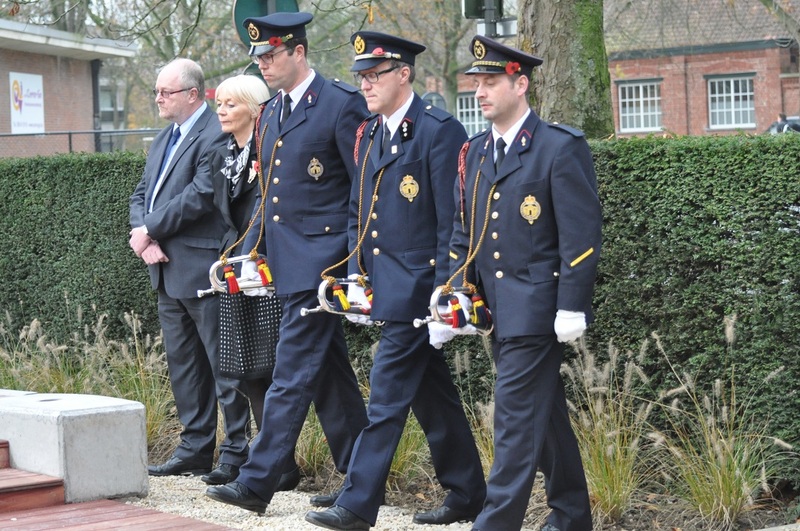 The memorial has been installed in the gardens of The Hotel Ariane in the centre of the town. Diane is to be congratulated on completing the project and doggedly raising funds through radio and newspaper interviews, etc. 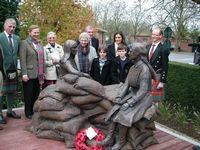 Many in the Clan Chisholm gave generously to the project to to commemorate our Society's founder and her friend Elsie Knocker. 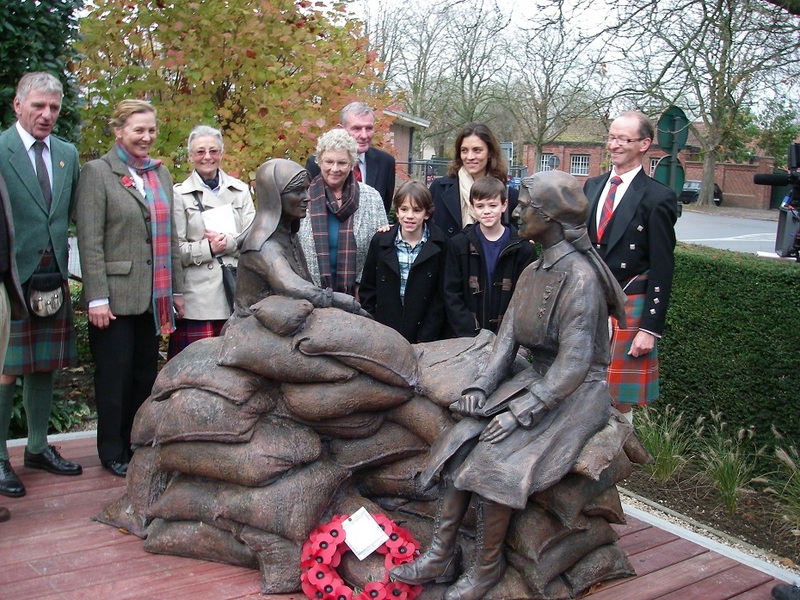 A group of Diane's family and friends arrived in Ypres for the unveiling ceremony on Saturday 22nd November 2015 along with some Clansfolk and many members of Mairi's family including Chief Hamish, his sister Susan and great nieces Mairi Angela Foster and Jenni Atkinson with their families. 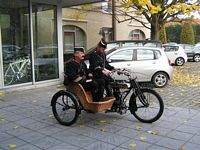 This date had been chosen for the unveiling ceremony as this was the day in 1914 when Mairi and Elsie set up their Poste in Pervyse. 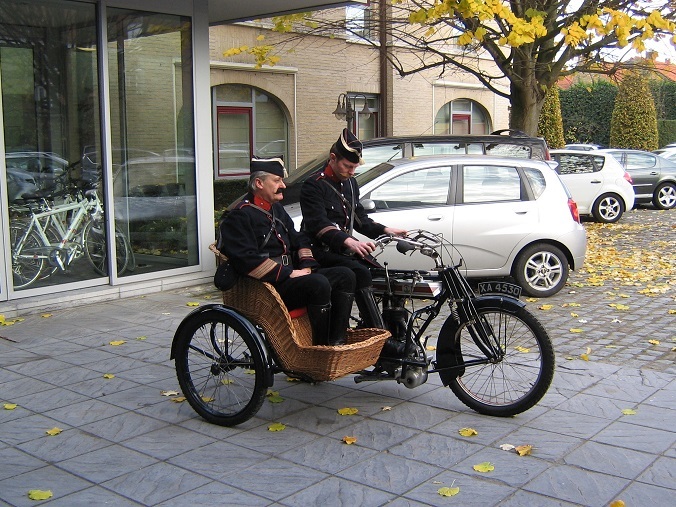 Diane had arranged for a drive-past of both British and Belgian motorcyclists as part of the ceremony - the group - in period dress - and accompanied by nurses of the time - opened the ceremony at 3pm. The piper played 'Will ye no come back again' before Diane and Mr Stefaan Vandenbussche (a member of the Flemish Parliamen with whom Diane had been working on the project) pulled away the Brtish and Belgian flags draped over the statue after which three buglers played 'The Last Post'. 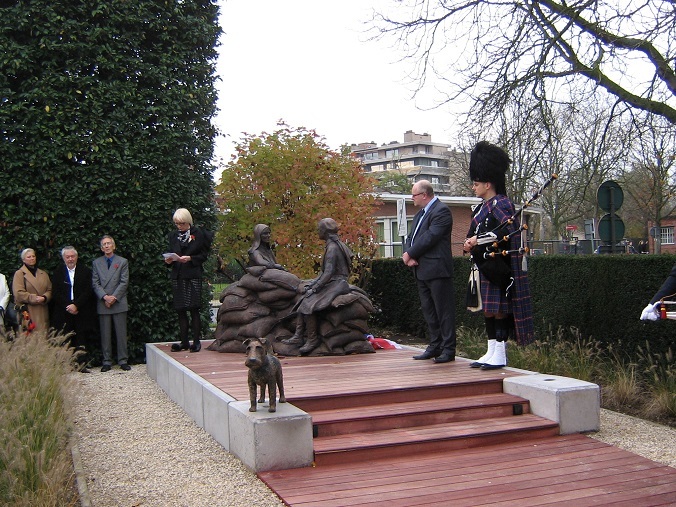 Diane and Stefaan then described the background to the project thanking the eminent Belgian sculptress Josiane Vanhoutte for the creation showing Mairi and Elsie sitting on sandbags with a small statue of their terrier 'Shot' who was killed in 1918 after an arsenic attack. 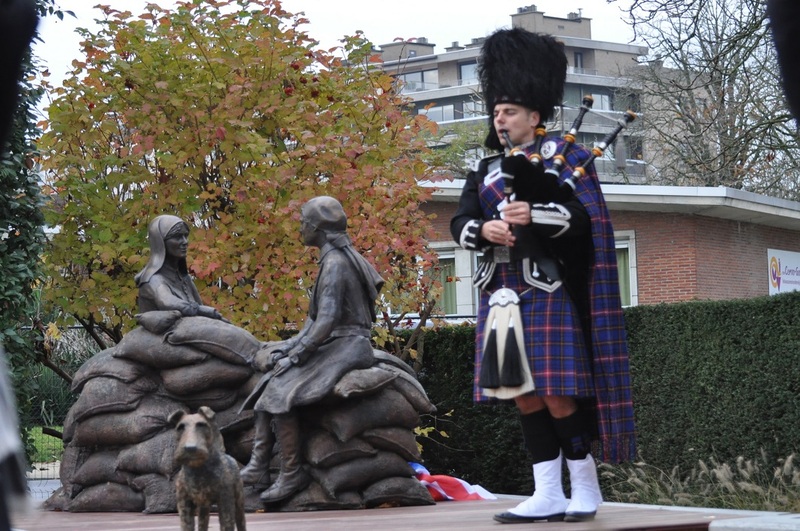 The ceremony ended with the piper playing 'Amazing Grace', group photos were taken and a small reception was held in the Hotel Ariane. 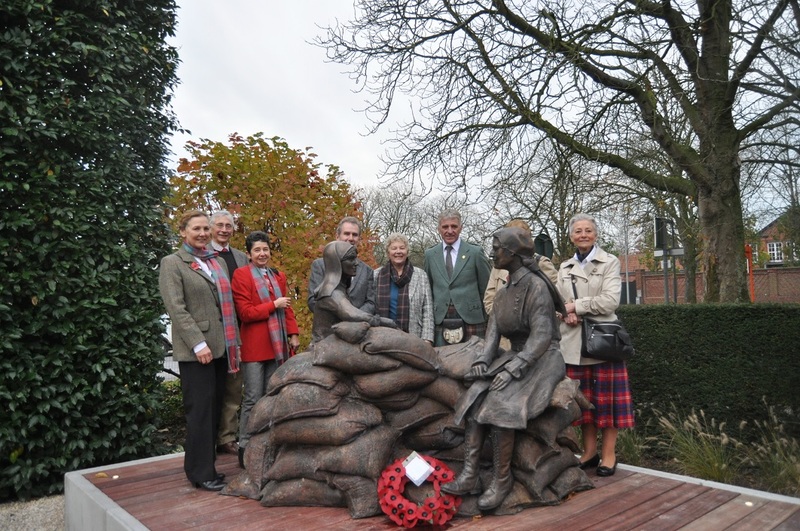 Some of the clan members and Mairi's descendnts with the memorial, and in the centre Mairi wearing the first of her several medals 'The Order of Leopold II' presented to Mairi and Elsie by the Belgian King Albert I in 1915.